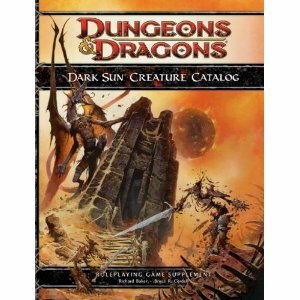 I was pretty surprised at the Dark Sun Creature Catalog. Aside from being in essence a Monster Manual, it also includes Monster Themes, Fantastic Terrain and Hazards, which have historically been part of the DMG’s. I guess this may come as a result of the Dark Sun setting being combined into one book, rather than two like Eberron and the Forgotten Realms were. Either way, it is a welcome addition to a book that was already a necessary purchase for DM’s planning on running a Dark Sun 4e game. So what’s in the book? Let’s take a look inside. At my count, there are 178 unique creatures in the book (although they are variations of the same type of monster, like 4 elves for example. Also, the heroic tier got plenty of love here, as over half the creatures in the book are for what I consider my sweet spot in the game, levels 1 through 10. It is also worth noting that the book utilizes the Monster Manual 3 stat block format. The big, bad, epic solo creature in the game is The Dragon of Tyr, a level 33 gargantuan solo controller with 1216 HP and a nasty Telekinetic Pulse encounter power. With the power to teleport at-will, this guy looks like a fun creature to throw at an epic level party. We also get stats for seven Sorcerer Kings (and Queens). If you are a fan of reskinning, as I am, this book is a nice one for you, because all these creatures can be taken and basically be given all new homebrewed backgrounds and you have no need to worry about them coming from Athas or not. Also, there are plenty of new undead here, like zombies, ghosts, and wights that would just as easily be applicable to any D&D setting. In the back of the book, there’s more juicy stuff for your DMing toolbox. Fantastic terrain and hazards are featured here, things like Defiled Terrain and Bloodtrees which will make your encounters achieve the “feel” of taking place on Athas, although there’s no reason you can’t apply these for other settings if you want. As I flipped through this book, I couldn’t help but think of that cheesy “Arena Fight” sequence in Star Wars Episode II: Attack of the Clones. Half the creatures in this book would make for a great arena encounter, and I’m pretty sure that was the thinking behind a few of these guys. A big part of the Dark Sun setting are arena combats after all. The Dark Sun Creature Catalog was written by my friend Chris Sims, Richard Baker, and Ari Marmell. Just picked this book up on amazon yesterday and now I’m patiently awaiting it’s arrival. The importance of reskinning cannot be overstressed. That’s what makes 4e as awesome as it is. I can’t wait to get this book and reskin the hell out of it. A great book! I am in a desert of ash right now in my campaign… So i got a few new nasty monsters to add here!